The Big Reactors mod adds multi-block power systems capable of providing large amounts of RF power to Minecraft. The specific arrangement and material of mod blocks in each multi-block structure determines the performance and behavior of the system as a whole. A power system can be built in one of two ways: a reactor can provide RF power directly, or a reactor can provide super-heated steam which is then pumped into a steam turbine to generate RF power. The latter option is much more expensive, but also much more efficient. The minimum size of a reactor is 3×3×3 blocks whereas the minimum size of a working turbine is 5×6×5. Systems with several multi-block structures of nearly infinite size can be built. Big Reactors greatly benefits from the support of mods which provide transport and fluid pipes such as BuildCraft. It can also interface directly with ComputerCraft and RedNet. Time lapse assembly of a small Reactor Structure. Reactors and turbines are multi-block structures made up of individual blocks arranged according to specific rules, which together create a large functional machine. Both reactors and turbines must be built as a closed, mostly hollow box with no holes and complete edges, including corners. The edges of this box can be, but not necessarily built from Reactor Casing or Turbine Housing blocks, and the faces of Reactor Glass or Turbine Glass blocks, respectively. In addition to these containment blocks, a number of other blocks are necessary to make a functioning reactor or turbine. None of these blocks can be placed on the edge or corner; they must be somewhere in the faces of the reactor, sometimes in very specific places. Right clicking on the reactor casing or turbine housing will display a message of what is missing. Important: Ensure that there aren't any metallic blocks within a 1 block radius of the turbine! Doing so results in unpredictable behavior with the turbine. Download this spreadsheet to calculate the required materials and their cost for any size Reactor structure. Use this Big Reactor Simulator to test the efficiency of different Reactor designs. All reactors must have exactly one Reactor Controller block, which provides the main interface for monitoring the status of the reactor. Access Ports are buffers that contain unused fuel and waste. Right-clicking a port brings up an interface that allows to add fuel, remove waste, and toggle inlet/outlet mode. An active reactor will use the fuel from the 'Inlet' port and dump waste into the 'Outlet' port. A Big Reactor needs at least one access port. The core of the reactor is an arrangement of Yellorium Fuel Rods. These must be stacked to stretch the entire interior height of the reactor. The entire volume of the reactor may be filled with fuel rods, but it does not have to be. The Reactor will be most efficient with the Fuel Rods placed diagonally in a checker board pattern with a coolant filling the gaps. Above each stack of Fuel Rods there must be a Reactor Control Rod, which allows the Player to adjust the depth of the Rod. It also tells the reactor where the fuel rods are so it can fill them with fuel. Reactors that provide RF energy directly need to have at least one Reactor Power Tap as part of the structure. The Power Tap can attach to any compatible Cable or Conduit that accepts RF power. Coolant Ports allow fluids to be injected into and steam drained from the reactor to be transported to feed a turbine. The Computer Port installed on a Reactor, allows ComputerCraft and OpenComputers blocks and items to control it. Like the Computer Port, the RedNet Port allows a reactor to interface with a RedNet network. The fuel inside the fuel rods generates power, radiation and heat. Heat is transferred to the adjacent 4 blocks from the fuel rods into a coolant or fuel rod block, and likewise radiation is transferred up to 4 blocks (dependant on adjacent block absorption) in the cardinal directions (North,South,East,West). Excess radiation and heat could cause the temperature in the reactor to rise above efficient levels and consume more fuel, since there is a penalty to fuel consumption at too high an operating temperature. A coolant reduces the temperature of a reactor, and moves heat from the reactor core to the reactor casing. The higher the casing heat, the higher the energy output and heat transfer rate of coolants . Any fluid used as coolant must be manually added to the reactor during construction, exactly as you would with solid coolant materials. Those looking to fill large reactors with fluids that fall, such as Gelid Cryotheum, may want to consider using a Flood Gate. Absorption: How much radiation this material absorbs to convert to heat. Ranges from 0 (none) to 1 (all). Heat Efficiency: How efficiently absorbed radiation is converted to heat. Ranges from 0 (none) to 1 (all). Moderation: How well this material moderates radiation. This is a divisor, and greater than or equal to 1. Conductivity: Amount of heat transfered on each exposed face. A Turbine produces energy from Steam generated by an active cooling Reactor or generated using one of 6 other mods methods. Steam is converted back into water, which may be recycled into a Reactor to produce more steam. For each rotor block in the turbine made of either a Turbine Rotor Shaft and a Turbine Rotor Blade, a mass of 10 is added . The three values are always averaged together to give the resulting values for the entire turbine coil. A higher efficiency will always produce more power. A higher drag will produce more power, but will slow down the rotor more when induction is enabled. A higher bonus will also always produce more power. Turbines convert steam into water at an even ratio, and produce a certain amount of RF per tick depending on the coil material and turbine design. Steam intake is always between 0 and 2,000 mB per tick. The rotor speed gauge only shows between 0 and 2,200 RPM, but the actual rotor speed can be higher. Generated energy is always positive or 0. The width of the turbine frame is not a factor of energy output. The number of rotor shafts isn't a very large factor of energy output. Dimensions used are at the Player's discretion. If maximum rotor speed is unlimited and 2,000 mB per tick of steam is available, it is most efficient to use 80 rotor blades. If the rotor speed is limited to 2,000 RPM, perhaps more rotor shafts and fewer rotor blades would be preferable in order to keep the rotor speed above 1,796.27 but below 2,000 RPM while optimizing energy output. 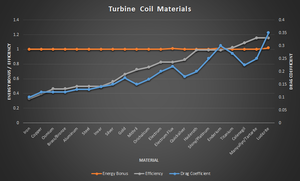 All blocks of the coil do not need to be made of the same material, but are averaged together to determine the turbine's score in each of the three coil traits. This makes it possible to make composite coils that use cheap filler metals in balance with high end metals to maximize limited resources. It also means, however, that adding a ring of a low performing metal to a turbine with several rings of a high-perfomance metal may actually reduce the output. BladeSurfaceArea = Number of rotor blades in the turbine. RotorMass = Total combined mass of the rotor blades and rotor shafts. See the table above for the mass of each block. CoilSize = The number of coil blocks in the turbine. InductorEfficiency, InductorDrag, InductorBonus = The average Efficiency, Drag, and Bonus of each coil block (from the table above). RotorSpeed = The speed of the rotor as displayed in the turbine controller GUI. The turbine is at maximum efficiency (100%) at 898.134 RPM and 1796.27 RPM. It has an efficiency of 50% when less than 500 RPM, and at 1347.2 RPM. This doesn't mean, however, that a turbine is most energy efficient at 1796 RPM. a and b are both constant and are only dependent on the design of the turbine and the control values in the turbine controller. If the turbine inductor is disengaged then InductionTorque equals zero. 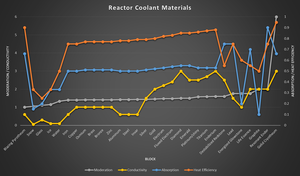 ↑ It is important to note that the coolant discussed in this section is completely unrelated to the Reactor Coolant Port. These would be more accurately described as the moderating material of the reactor, whereas the coolant port accepts only water for the generation of steam. ↑ Fantasy Metals: Mithril, Orichalcum, Quicksilver, Haderoth, Celenegil, Tartarite and Manyullyn may also be used as coolant material. ↑ As of v0.3.4A2, any material will have a mass of 10 units per block. In the future the mod developer plans to allow the rotor to be constructed out of different materials. ↑ 5.0 5.1 5.2 5.3 5.4 5.5 These six materials only work if the use of fantasy metals is enabled in the Big Reactor config file. On Valentine's Day, turbines spawn hearts instead of steam cloud particles, and reactors spawn hearts instead of heat packet particles. This has no effect on game mechanics and is purely a graphical change. Reactors from Big Reactors mod are similar to real world RBMK-1000 breeder reactors, one of which was the Chernobyl reactor. This page was last modified on 1 January 2019, at 23:15.